The Department of Mathematical Sciences hosts the Mathematical Sciences Research Group (MSRG). The MSRG focuses on two main areas – Analytics and Applied Mathematics. Over the past couple of years our focus has been on enhancing research in the Mathematical Sciences through collaboration. 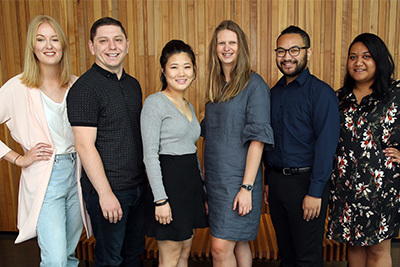 Academic staff who conduct research in this area include Professor Jeff Hunter, Dr Robin Hankin, Dr Kate Lee, Dr Sarah Marshall and Dr Nuttanan Wichitaksorn. Academic staff who conduct research in this area include Professor Jiling Cao, Dr Alla Shymanska, Dr Hyuck Chung, Dr Wenjun Zhang, Dr Farida Kachapova and Dr Alna van der Merwe. Mathematical Sciences staff have the opportunity to invite speakers from outside AUT to deliver talks in areas where some form of collaboration may eventuate.